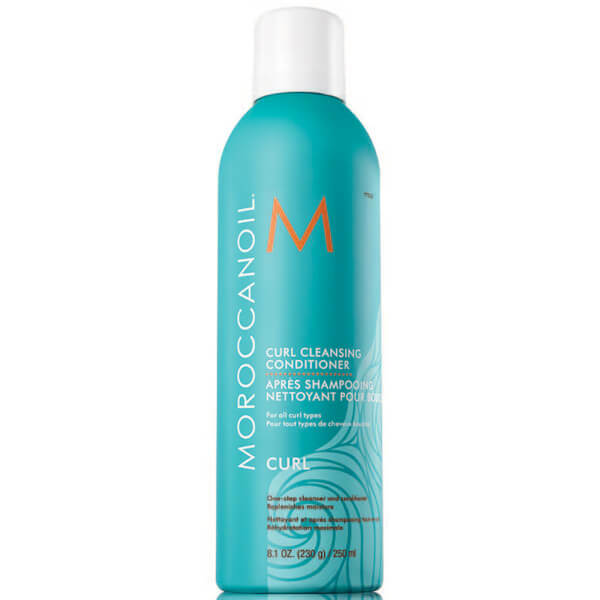 Achieve salon-worthy results from home with Moroccanoil's Curl Cleansing Conditioner; a frizz-fighting formula that ensures perfectly defined curls every time. Infused with Argan Oil and natural Tea Tree Oil, the two-in-one shampoo and conditioner expertly cleanses and refreshes hair, whilst nourishing and detangling to leave you with smooth, manageable locks from root to tip. Packed full of vitamins, antioxidants and vegetable proteins, the luxurious treatment hydrates and revitalises as it restores suppleness and bounce. Rub a quarter-sized amount between palms. Thoroughly work into wet hair and scalp. If desired, let absorb for 5 minutes. Rinse out, continuing to massage. Aqua/Water/Eau, Isopentane, Cetearyl Alcohol, Decyl Glucoside, Dimethicone, Glycerin, Stearalkonium Chloride, Behentrimonium Methosulfate, Isobutane, Glyceryl Stearate, Peg-100 Stearate, Oleanolic Acid, Apigenin, Panthenol, Biotinoyl Tripeptide-1, Menthyl Lactate, Aloe Barbadensis (Aloe Vera) Leaf Extract, Arnica Montana Flower Extract, Helianthus Annuus (Sunflower) Seed Extract, Achillea Millefolium (Yarrow) Extract, Calendula Officinalis Flower Extract, Chamomilla Recutita (Matricaria) Flower Extract, Echinacea Angustifolia (Echinacea) Extract, Fucus Vesiculosus (Bladderwrack) Extract, Geranium Maculatum (Cranesbill) Extract, Juniperus Communis (Juniper) Fruit Extract, Melissa Officinalis (Balm Mint) Leaf Extract, Salvia Officinalis (Sage) Leaf Extract, Melaleuca Alternifolia (Tea Tree) Leaf Oil, Simmondsia Chinensis (Jojoba) Seed Oil, Argania Spinosa (Argan) Kernel Oil, Peg-40 Hydrogenated Castor Oil, Hydroxyethyl- Cellulose, Hydrolyzed Vegetable Protein Pg-Propyl Silanetriol, Ceteth-10 Phosphate, Dicetyl Phosphate, Caprylyl Glycol, Ppg-26-Buteth-26, Steapyrium Chloride, Ethylhexylglycerin, Hexylene Glycol, Butylene Glycol, Citric Acid, Disodium Edta, Sodium Nitrate, Edta, Potassium Sorbate, Chlorphenesin, Benzoic Acid, Sorbic Acid, Sd Alcohol 40-B (Alcohol Denat. ), Phenoxyethanol, Parfum/Fragrance, Linalool, Alpha-Isomethyl Ionone.